WWW.PRESIDENTS"R"US.COM / 9/11: What Becomes A Legend Most? 9/11: What Becomes A Legend Most? The world will little remember reaching for the remote, desperate to squelch George Pataki’s insulting reading of the Gettysburg address on the first 9/11 anniversary. Some feared the vapid inanity of 2002’s commemorations could never be topped, but presidential libraries are doing their part. Having apparently run out of things to say about either their nominal subjects or their periods, today’s presidential libraries seek to present themselves as founts of Everyhistory, places to mark any odd occasion with history slapped on. And try , if possible, to include motorcycles. At least four presidential libraries will mark the decade since 9/11, each in their own baffling manner. The Franklin Roosevelt Presidential Library is at least in the same state as one target…but after that the relation gets kind of strained. They will be displaying a chunk of metal from the World Trade Center wreckage. We might have enjoyed a retrospective on our relationship with our gallant Saudi Arabian ally, beginning with FDR’s quiet 1945 interlude with King Saud. and they’ve rounded up some local rescue workers. No word if Bandar Bush will show up. to the Boy Scouts, who will be hanging about all day. And yes, they do have a chunk of the World Trade Center. 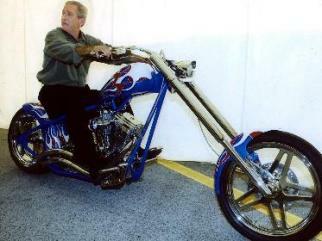 The Nixon Library will go all out for the memories. Sixteen tons of World Trade Center steel will arrive in ceremony Monday, and be available for public gawking all week. Tuesday will feature Angie Kardashian, one of the lesser known Kardashians. Her claim to fame is post-9/11 firehouse cooking, not self-porning. Let us pray 9/11 souvenirs don’t become the latest presidential library must have object. At least until they all get their Berlin Wall chunks squared away. The Reagan Library will be bursting with 9/11 goodness. 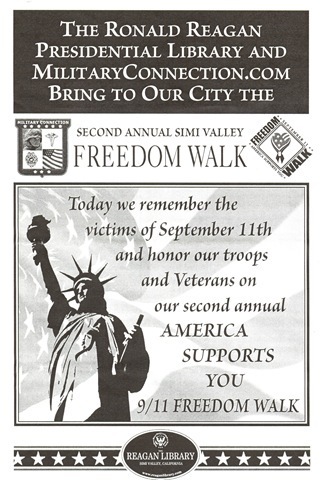 The Library will serve as a start point for Simi Valley’s “Freedom Walk,” Donald Rumsfeld‘s effort to mashup the initially popular Afghanistan war together with Iraq in a delightful Freedom Smoothie. The program will feature a 9/11 emergency worker, and they’ve dug up a prize. Out of all the rescue workers on the scene on 9/11, they’ve chosen the Scientologist. His “controversial” church got a reputation at the disaster site of proselytizing and sneaking around barricades, but New York Fireman John McCole was their man on the inside. With her proven record of cult attraction, did the Scientologists get to Nancy Reagan? 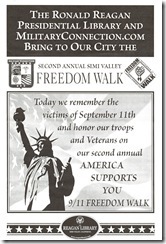 The Reagan Library never lets a marketing moment pass, as they demonstrated with their 9/11 commemoration page. You’ll come to honor the dead, you’ll stay to purchase souvenir Air Force One replicas. This entry (permalink) was posted on Wednesday, August 31st, 2011 at 11:58 PM by mr.president and categorized in AMERICAN HISTORY, AMERICAN PRESIDENTS, BERLIN WALL, FIRST LADIES, GEORGE H.W. 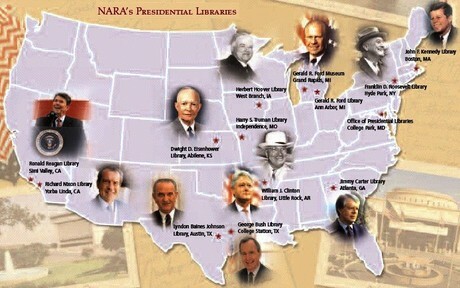 BUSH, GERALD FORD, HISTORY IN THE NEWS, NANCY REAGAN, PLACES & THINGS NAMED REAGAN, PRESIDENTIAL HISTORIAN, PRESIDENTIAL HISTORY, PRESIDENTIAL LIBRARY, PRESIDENTIAL MARKETING, PRESIDENTS OF THE UNITED STATES, RICHARD NIXON, RONALD REAGAN, UNITED STATES HISTORY, US PRESIDENTS, VICE PRESIDENTIAL HISTORY. « Barack Obama: Escaping The Sleazy Relations Cashing In Syndrome?